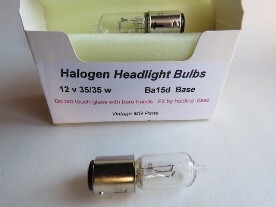 Halogen 12v 35/35 watt headlamp bulbs. The photograph on the left below shows Lucas headlamps fitted with standard bulbs. The photograoh on the right below shows the car fitted two minutes later with the halogen bulbs and which are rather brighter than the standard bulb. The halogen bulb is a direct replacement and utilises a standard bayonet fitting. Note: when fitting, it is essential that a clean cloth is used to handle the bulb as otherwise grease deposits from fingers will cause the bulb to overheat and fail.